People who think I am a downsizing/minimalist fundamentalist, are surprised when they come into my livingroom and see a number of wall hangings. We don’t have many, but almost all of them are handpainted art (like the family portrait featured in this post). They are all gifts, and have a personal touch. For example, the piece in the photo above was made for me by a calligrapher I met near Babolsar in northern Iran, on the coast of the Caspian Sea. It is the opening line from an Omar Khayyam poem, that translates into English as “Arise o gracious treasure!” I originally hung it up over my bed. The artist, Farhangi, was knowledgeable about Japanese calligraphy, and wanted to show me how it was done without a brush. He wrote this out, signed it and gave it to me, joking about its potential worth. I put in a camel bone frame bought at a bazaar in Tehran and have had it hanging in every home I have lived in since receiving it in 2004. It is an important token to me, a good story-piece for when people come over, and the poem is pretty good too! If I really wanted to, I guess I could get rid of it… . But it costs nothing to own, either in terms of space or environmental impact, and it spruces up the place a bit, making our living space interesting without any clutter. Besides this piece, we have our family portrait, a Japanese calligraphy piece, a painting of the Seven Lucky Gods, and this piece by a local artist and friend of my wife. None are mass produced, or kitschy, so I do not feel they impinge on our downsizing lifestyle, though admittedly they will have to go if we ever transition to a tiny house. Farhangi pictured with completed piece, and one of his other elaborate works. Camelbone frame I picked up in Tehran. Beautiful book with French and English translations where they showed me the line. For Muslims working in non-Muslim work environments, observing Ramadan is an epic feat of self-discipline. Working through Ramadan is an excellent piece on the Slack blog that I recommend for Muslims and non-Muslims alike. For Muslims, there are some tips on toughing it out with a 9 to 5 schedule, how to prioritize your focus throughout the day, and patience. Also, dealing with co-worker questions. For non-Muslims, this is an opportunity to learn about some of the things a minority has to deal with in the office, which only helps with your perspective as a human. This blog post reminded me of the exact inverse situation: being a non-Muslim office working during Ramadan in the Islamic Republic of Iran. I got into the taxi the embassy called for me and headed back to the hotel. Once back in my room I made a few phone calls … I also ate a granola bar. I was starting to feel a little dizzy from hunger. Maybe coming to Iran during Ramazan wasn’t a good idea. When traveling I always make sure to have a few granola bars packed just in case. The Ayatollah Khomeini stares down at Sarkiss Cathedral, a spectacular Armenian church in Tehran. There are about 250,000 Armenian Christians in Iran. One of my goals in Iran was to learn about the daily life of religious minorities there. It was during a party in northern Tehran, over pizza and beers, that I got the opportunity to learn more. I had a conversation with an Armenian Christian woman, who worked in a marketing office in Tehran. Since it was Ramadan I asked her how she dealt with it at work, since she is not obliged to fast. She told me that she had to be very careful, since just about everyone else in the office was fasting and struggling as the month went on. Her and one of her Christian co-workers would retire to a closet to eat during mealtimes or have a cup of tea. Everyone was rejoicing by the end of the month. Today is the last day of Ramadan for 2016, and I expect some excellent feasts to be had tonight. Foreign Affairs, Trade and Development Canada announced $9 million dollars in funding in partnership with the Munk School of Global Affairs at U of T for something called the “Digital Public Square project.” The CBC dubbed the project an experiment in digital diplomacy. The Globe called it “direct diplomacy.” The coverage in the National Post, Toronto Star et alia related how the project aims to allow government firewall circumvention, information sharing, and increase government accountability for citizens in “oppressive societies.” Leaving aside the questions around the efficacy of “digital diplomacy” (UPDATE: Taylor Owen outlines some of the perils), I was curious as to why there were no details on the “how.” Where is this money going to? Much of the news coverage focused on current efforts to engage Iranians, which is pretty confusing since the project seems to be about spreading to other countries. But how can we tell? There is no roadmap, and the hard questions have yet to be asked by the press. How can you announce $9M without saying how it will be used? Until we get some more information, I took a look at the current Munk Center-backed program to engage Iranians. On May 10th, 2013, the Munk School launched a new kind of digital public square for Iran. 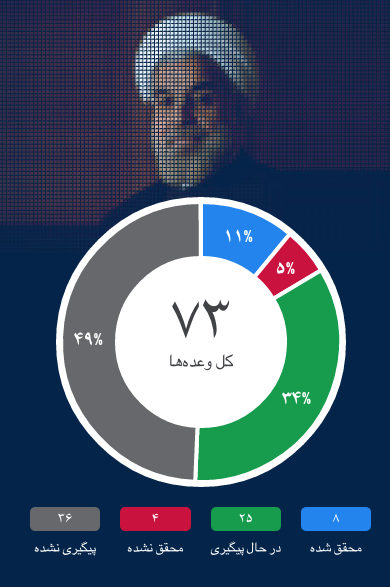 … within two weeks, more than 360,000 unique users had connected with the Global Dialogue from inside Iran, and had visited the site over 1,490,000 times. I am unclear as to how you would measure success. Iranians are notoriously political. Robert D. Kaplan once compared getting into a taxi in Tehran with getting into a taxi in Damascus: in Tehran the cabbie would right away start bitching about the government, while in Syria the cabbie was silent. My experience was like this too. In 2004, during Ahmadinejad’s antagonistic era, I was in Iran covering the US presidential election (when George W. Bush was elected for a second term). Everybody wanted to talk to me about politics. Admittedly, I did spend most of my time with the kind of people who would hang around foreigners. They all listened to the BBC because they couldn’t trust their own newsmedia. However the blue-collar folk that I stayed with for my last week thought the BBC was propaganda. There are sharp divisions in the country to be sure, but Persian-language satellite channels, radio, websites etc. abound, especially thanks to the diaspora in Los Angeles. For years now, there has been a lot of civic activity around getting anti-regime voices to Iranians in country. I am unclear as to how a “digital public” square would be perceived any different. And it doesn’t explain how Iranians are being protected online. So why is the Canadian government putting $9M in? That is a princely sum for a small startup guy like myself. Just from the news coverage, I don’t get it. I reached out to the Munk Center on Twitter and they recommended a couple of sources. Again, they related only to the current Iranian efforts, nothing about the future. Still, it did answer a couple of my questions. For example, circumvention. Psiphon originated as a project at the Citizen Lab (one of my fave orgs). They use a combination of VPN, SSH and proxies to get you around official barriers. Open source too. I am sure these guys could use some funding, so I hope they see some of that 9 mil. Another org Munk pointed me to is ASL19, which seems like a sort of Citizen Lab focused on Iran. They have links with other orgs and other cool sites like Meidoon Watch which is kind of like a Hacker News for Iranian stuff. Seems useful. I wish I knew how much activity on that site is actually from inside of Iran. The Iranian diaspora is in the millions. There is certainly a network of organizations working on the Iran problem. The new Foreign Affairs money must be going to replicating these networks in other countries. I am just frustrated that Foreign Affairs and the Munk Center aren’t giving us more information on their plans, and that the press hasn’t asked for more. Sorry for this rambling post, but there is a bit of an information vacuum here, and I thought I would draw attention to it. I will gladly update this post if someone can provide answers. Or feel free to add some in the comments. 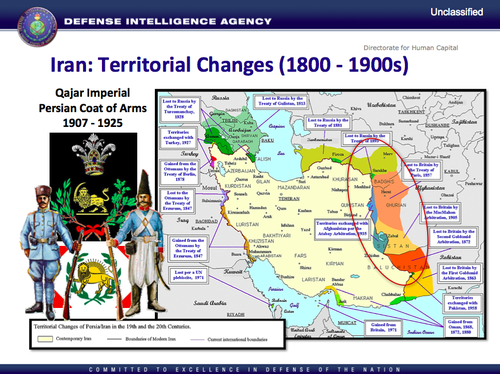 Although this DIA presentation on the “new” Great Game is too high level to be really insightful, and is guilty of being an OWerpoint (also see this example) in some places, there are some really handy slides detailing Iran’s claims to surrounding territories. 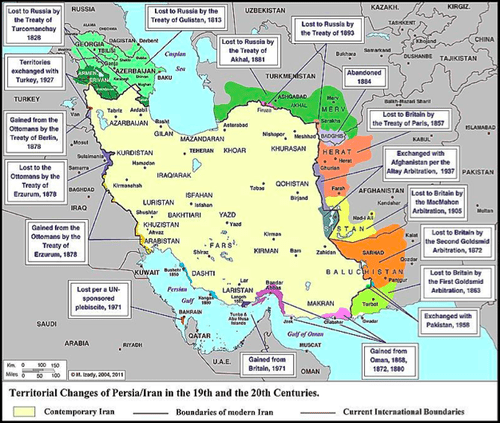 Obviously the Persian empire had a massive expanse of territory, but these do a good job of showing Iran’s claims in the modern era.